At many participating restaurants such as Canton, Dwarf House , Outlets, Towne Lake, Roswell Corners, Lassiter , Kennesaw , Acworth, Marietta East Lake , North Point Mall, and more! Check with your local Chick Fil-A for participation. Ice cream lovers can get a free small vanilla soft-serve cone at participating locations on Monday, March 20. 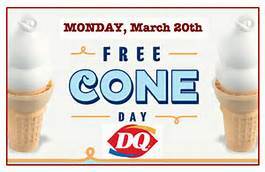 Dairy Queen will also be accepting donations for Children’s Miracle Network Hospitals.